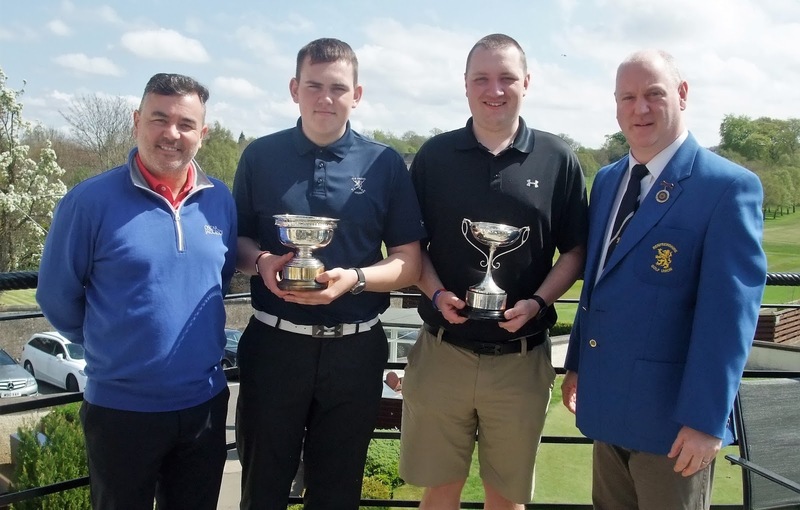 Left to right: Robert McIlroy (Captain, Elderslie GC), Euan McNeill (winner Caven Trophy), Stewart Watt (winner Menzies Trophy), Derek McGlynn (Renfrewshire GU president). Unusually for RGU Competitions, the sun shone all day. The course, as always, was a test for those taking part, and, allowing for the recent poor wet weather, the course was playing well but with little run available. However, the greens were in superb condition. This was reflected in the majority of the scoring on the day. In the Boys Caven Trophy, Euan McNeill of Lochwinnoch Golf Club was the winner of the Renfrewshire Golf Union Boys Stroke Play Championship retaining the title he won last year, with a Gross score of 71 having played steadily throughout his round. Euan is currently furthering his golf career at the University of the Highlands and Islands based in Dornoch. In the competition in the Youth Category for the Menzies Trophy the winner was Stewart Watt – The Old Course Ranfurly with a Gross score of 70. Stewart was in the first group out and his score was never bettered despite the quality of the other players in the field. Runner up was local Club Champion Colin Edgar - Elderslie Golf Club on 72 and third with the better inward half beating his club mate Stuart Thomas on 73 was Calum McAlpine - Erskine Golf Club. The Caven Trophy was sponsored once again by Paisley-based, family-run company STRATHAND FIRE and SECURITY www.strathand.com and we thank them for their continued support of the event.